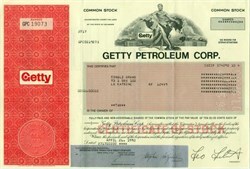 Beautifully engraved Certificate from the Getty Petroleum Corporation issued in 1989 - 1993. This historic document was printed by the Security Banknote Company and has an ornate block border with a vignette of an allegorical man next to two world globes and the famous Getty logo. This item has the printed signatures of the company's officers, including it President, Leo Liebowitz. Capitalizing on its background in black gold, real estate company Getty Petroleum owns and leases about 1,100 service station and convenience store properties and 10 petroleum distribution terminals in 12 northeastern and mid-Atlantic states. These properties are leased to Getty Petroleum Marketing, which is responsible for taxes, maintenance, repairs, insurance, and other operating expenses for the properties. Getty Realty was formed in 1998 when it spun off Getty Petroleum Marketing and sold its heating oil distribution business in Maryland and Pennsylvania. A partnership controlled by CEO Leo Liebowitz and director Milton Cooper owns nearly a quarter of the company. 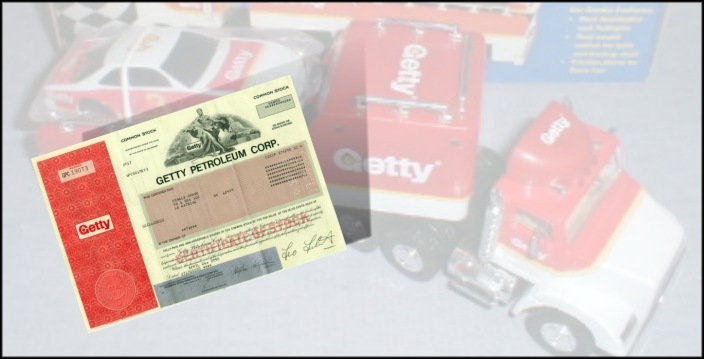 Getty Petroleum Marketing is an independent distributor of motor and heating fuels. It operates in 12 northeastern and mid-Atlantic states through almost 1,300 service stations, some of which maintain convenience stores, automotive repair centers, or car washes. It also runs 10 distribution terminals and bulk plants, used for storing and distributing petroleum products purchased from regional suppliers.